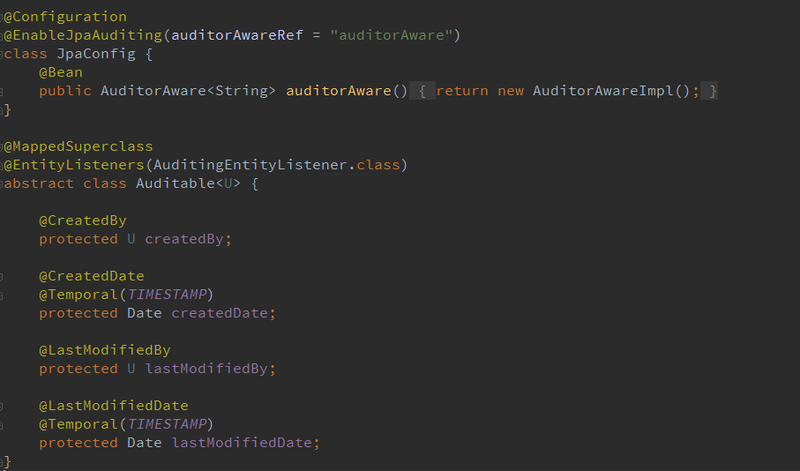 So in your entity class, created_by is type U, but your AuditorAware return String, does spring automatically map user by userName string? great! work naresh! would it be possible for you do a in depth tutorial on spring session management?? Thanks friend! I will try to do it. So while updating a record my created_by, created_date field are updating to null values. how can I fix it? This should not happen if you follow the article and the code, you can see the complete code at mentioned GitHub link and try replicate your scenario. @CreatedDate annotation. This identifies the field whose value is set when the entity is persisted to the database for the first time. Nice work, I tried it with both MySQL and MS-SQL, it's working fine with MySQL but in MS-SQL only the user is getting saved and updated. Hi Arun, Generally this should not happen, do mind sharing your github link for your code so we can have a look.